By now legendary our “BUMPER CAR RINK” Flatland Floor! Just like the previous years we’re offering the best possible FLATLAND FLOOR for our riders. 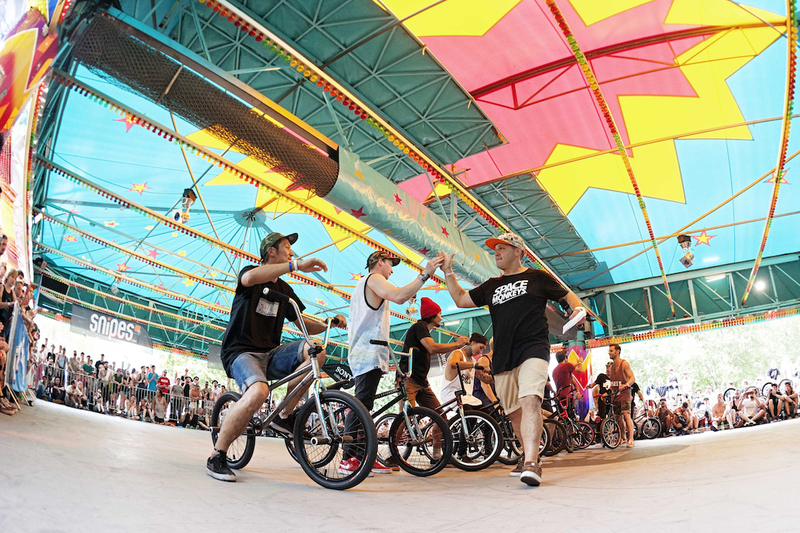 The Flatland Highlight weekend will be presented and ran by the Master of Ceremony Mr. Scott Obrien. Expect the crème de la crème of the international BMX Flatland Family to be at the Jugendpark this summer. Flatland being the most progress discipline in BMX, it will be interesting to see what’s new in the Flatland World?! This discipline is based on the legendary Braun Spine Ramp that has been copied many times over the years. We have the original and we’ll extend the ramp with all kind of additional elements, such as Box Jump, Hips, Walls and extensions to create Park layout. It will be placed in the center of our venue at Jugendpark. One of the favorite disciplines of our participants and spectators will be back under the Zoo Bridge that creates this unique “BMX WORLDS COLOGNE ATHMOSPHERE”. Thousands of BMX enthusiasts cheering for some of the best Dirt riders in the World. For over 15 Years Markus Hampl a former BMX Pro is in charge of creating and building our Dirt Lines in Cologne, expect the unexpected.